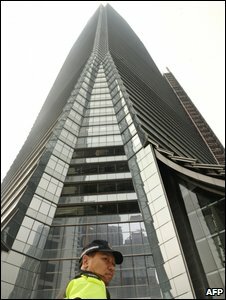 Six workers have died in Hong Kong after falling 17 storeys down a lift shaft in what is set to become the territory's tallest skyscraper. The workers were on a platform that gave way on the 27th floor, plunging them to the 10th. The International Commerce Centre in Kowloon's Tsim Sha Tsui district will become the world's fourth tallest building on completion in 2010. Chief Executive Donald Tsang visited the scene and pledged a full inquiry. Emergency workers initially recovered three injured workers but they were confirmed dead on arrival at hospital. Three more bodies were later retrieved. Mr Tsang pledged support for the families of the dead workers and said there would be a full investigation. Broadcaster RTHK quoted Labour Secretary Matthew Cheung as saying that the developer, Sun Hung Kai, had agreed to pay the families of the dead workers HK$1m ($129,000) in an ex-gratia payment, before the payment of other compensation to be determined later. When it opens next year, the International Commerce Centre will rise to 118 floors. Only the Burj in Dubai, the Shanghai World Financial Centre and Taiwan's Taipei 101 will be taller.